If I said I was excited about the Shi Ying SR-31, it would be a huge understatement. 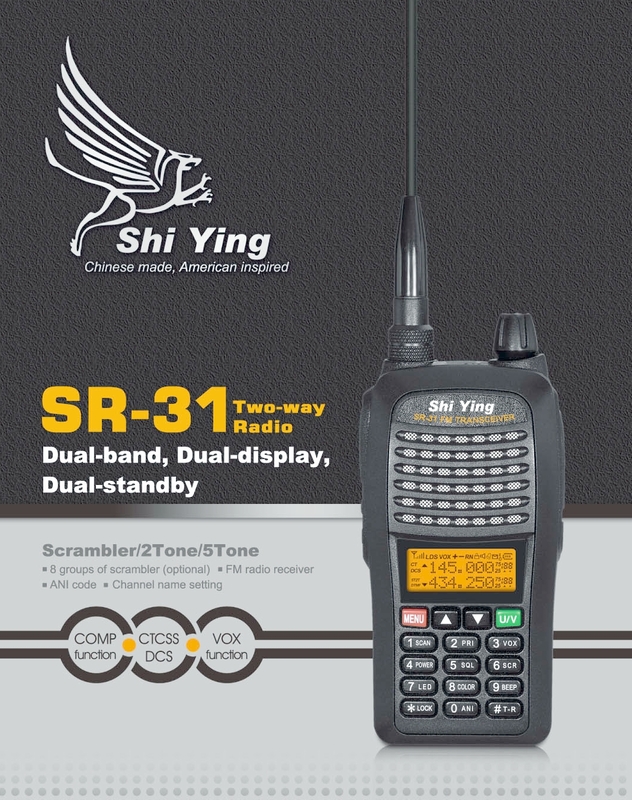 It is a Chinese dual-band (2M/440), dual-display, dual-standby handheld transceiver. Don't understand my excitement yet? What if I told you Shi Ying was Chinese for Griffin? As in Ed Griffin of Import Communications. Ed's about to release a new radio and he's putting his name (in Chinese) behind it. I like it. "I'm having a Chinese company make a dual band ht for me to my specifications. Features will include 2/5 tone and the ability to add/remove a channel from the scan lineup via the keypad. Unlike many other Chinese radios, when scanning, this radio will skip over channels that don't contain matching CTCSS tones. Many others will stop on a carrier even if the tone is not present. The brand name is Shi Ying, which is a Griffin in Chinese." Check out a picture of the radio and the cool company logo below. I like the tag line "Chinese made, American inspired." More information about dates and price when I have it. How about a real dual standby (not a back and forth scan between A/B a.k.a TDR). How about covering the 1.25m band? How about some real squelch levels and multilevel signal meter? I think we got to the point we need a little bit more quality and features, not another privately labeled clone. If Ed is in position to ask the Chinese to do things, maybe he should ask his customers / potential customers what they would like to see. I have to think he is working towards many of those things. If any of them were trivial, all the Chinese manufacturers would be doing them. My company has two plants in China and (excluding our other US plant) I prefer working with them over all the other locations - Mexico, Europe, Brazil, etc. But it is still hard. I agree that everyone would like better radios with better features, but clearly there is a market for these radios as is. People like saving money and are putting up with the shortcomings. I meant to add one more reason I like Ed. He was extremely active on-line in trying to give help when the Wouxuns first came out. His efforts were invaluable as we were all learning about the KG-UVD1P. Brick, no reason to be apologetic at all. I think Ed is probably a great guy, (I don't know him personally). I apologize if I seem too harsh. All I was trying to do is merely suggesting that Ed should ask them for some basic things that were issues mentioned by people here and on Hans'es blog. If you remember, we where talking before with the guy from Radio-Mart, that said he got the TYT UV-F9 to do 3 Watts on 222 MHz, I was really looking forward to get that, and maybe Ed can get it, who knows. All I care about is to make sure we, the consumers are being heard. This is indeed a TYT TH-UVF1 in disguise. They're not particularly bad, nor impressive - just middle of the road. I've had a few in for repair (blown-out finals). To put this in perspective: I never saw one of the popular UV-5R's with the same problem, while these TYT's are extremely rare. There's one on the bench right now, but I'm afraid this one is beyond repair. I might take a few pics of the PCB and post them.